GOP-Controlled Senate Considering Red Flag Laws, A Form Of Gun Control The Senate Judiciary Committee held a previously scheduled hearing Tuesday on so-called red flag laws, which allow for the temporary removal of guns from individuals if they are deemed a risk. Sen. Lindsey Graham, R-S.C., the chairman of the Senate Judiciary Committee, will preside over a hearing Tuesday on red flag gun laws. Tuesday, in the previously scheduled hearing, the full Senate Judiciary Committee heard from experts on extreme risk protection orders, commonly referred to as red flag laws. These laws allow law enforcement, and in some states, relatives and other concerned parties, to petition judges in order to temporarily restrict access to firearms from people who may be a harm to themselves or others. Supporters of the laws say they can save lives by removing guns from individuals who should not have them. Some states have used the laws to successfully protect individuals from suicide, at least one study shows. Opponents of such laws say they violate the second amendment and say they do nothing to thwart the underlying issues causing the threat. Senate Judiciary Chairman Lindsey Graham, R-S.C., in his opening remarks, sought to play down fears of second amendment infringement. "There are a lot of people [who] may be worried, 'Is the government going to come take your guns?' And the answer is, 'No,' " Graham said, hinting that one day he hopes there could be a federal process for law enforcement or family members to be able to petition a court signaling someone is "about to blow." But the Senate hearing's focus was on a handful of states that have already implemented extreme risk protection laws. 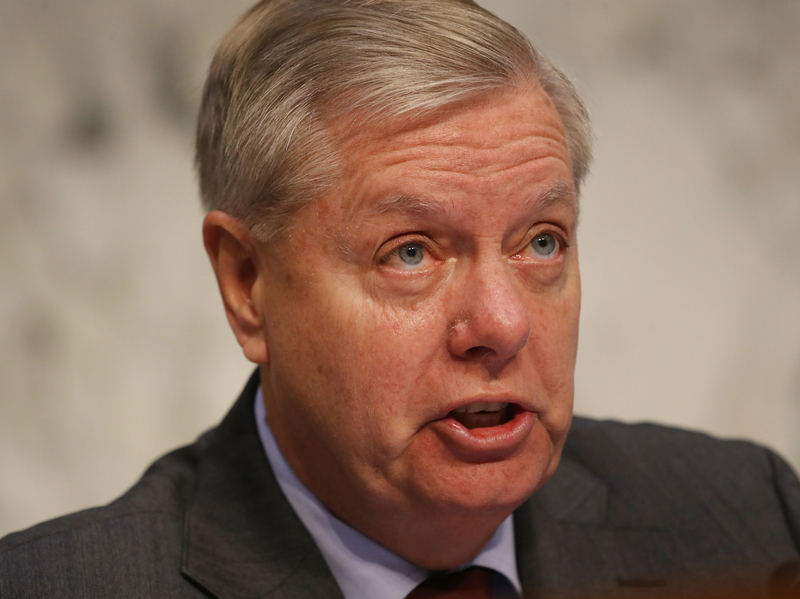 Graham, himself a gun owner, acknowledged that getting a federal red flag law is not likely. "I think passing a federal law is probably beyond what the market will bear. But creating an incentive at the federal level for states who want to go down this road...I think that's the best way, at least initially to solve this problem," Graham said. Instead, he hopes to get a federal law enacted to incentivize states to create their own unique extreme risk laws. California Sen. Dianne Feinstein, the committee's top Democrat, said future red flag laws should include what amounts to be a progressive wish list of gun control measures, including universal background checks, closing the so-called Charleston loophole and banning assault weapons. "To be clear, extreme risk gun laws are a vital part of that effort," Feinstein said. Since the deadly shooting in Parkland, Fla., last year, nine states have enacted their own extreme risk laws. In all, 14 states have them on the books. Colorado, where the bill is backed by a lawmaker who lost his son in the 2012 Aurora movie theater shooting, appears to be on the verge of passing one of its own. The issue of suicides was also a focus during the hearing. Ronald Honberg, a senior policy advisor at the National Alliance on Mental Illness, told the panel that suicides were the second leading cause of death for young people ages 10 and 24 in 2016, and account for 60 percent of gun deaths in the U.S. He urged lawmakers to avoid referring to extreme risk protection orders as "red flag" laws because they may stigmatize those suffering from mental illness and "may inadvertently drive people away from seeking help when they need it." The hearing comes at a time when there may be renewed national interest in red flag laws due to the string of recent apparent suicides including the two survivors of the Marjory Stoneman Douglas school shooting and Jeremy Richman, whose daughter was killed in the 2012 shooting at Sandy Hook Elementary School in Newtown, Conn. While the hearing was taking place inside, outside the U.S. Capitol, activists from March For Our Lives were joined by some Democratic lawmakers at a rally. They urged the GOP-controlled Senate to take up bills the Democrat-led House approved last month to broaden the federal background check system. An art installation on the U.S. Capitol grounds Tuesday depicts a student sitting at a desk surrounded by a red and white flowers in the shape of a bullseye. Activists hope it will spur Congress to pass gun background check bills. Rep. Ted Deutch, D-Fla., whose district includes Parkland, said it's been a difficult week in Parkland and in Newtown, Conn., alluding to the recent suicides that have taken place there. "It's OK to ask for help. It's OK to lean on one another," Deutch said. "We've got to ask the questions of our friends and family who have survived gun violence, 'Are you OK? Do you need help?' "
Connecticut Sen. Richard Blumenthal, a Democrat, agreed. "Their lives and deaths show us that the shattering trauma of gun violence isn't limited to a single day or an incident," Blumenthal said. 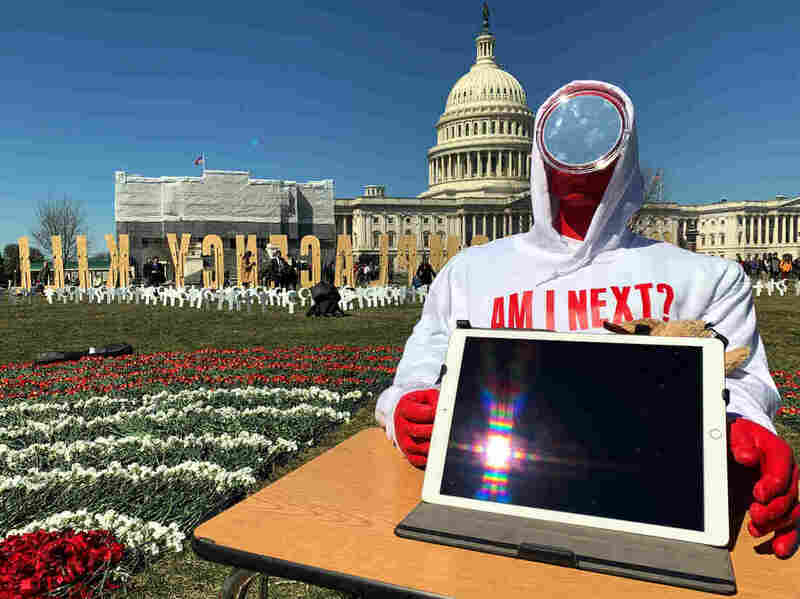 During the rally, March For Our Lives chief strategist, Matt Deitsch, led members of the media through an art installation on the east lawn of the Capitol. The work, which included hundreds of makeshift headstones to represent weekly gun deaths in America and 10-foot tall block letters that read: "your complacency kills us." Deitsch was asked if the GOP-controlled Senate holding an extreme risk protection law hearing could be considered a victory for the gun violence prevention movement. "I need to see a lot more to call it a victory." Hafsa Quraishi, an intern at NPR's National Desk, contributed to this report. An earlier version of this story misstated the number of suicides in the U.S. through use of a gun. Suicides account for 60 percent of gun deaths in the U.S., not 60 percent of all U.S. deaths.